UN troops in the Democratic Republic of Congo have launched an offensive, shelling positions held by rebels near the eastern city of Goma. 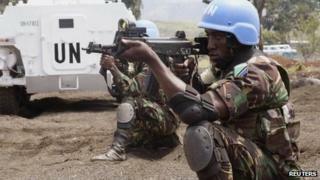 The UN was responding to shelling from M23 rebels on Goma on Thursday, a UN spokesman said. Congolese officials say five civilians in the city died. A M23 spokesman told the BBC it had not attacked the city, blaming the army for provoking the fighting. A new UN intervention brigade is deploying to the area to tackle rebels. It has a mandate to neutralise and disarm rebel fighters. Its 3,000 soldiers are joining the regular UN peacekeeping force, Monusco, which has more than 18,000 troops on the ground with a mandate to protect civilians. UN spokesman Lt-Col Felix-Prosper Basse said two UN helicopters were involved in the latest operation, which was being backed by the Congolese army, attacking rebel positions in Kibati about 15km (nine miles) north of Goma. "Fighting has entered a new phase as Monusco is now engaging the rebels together with the government forces," he told the BBC's Focus on Africa programme. The UN troops were protecting the area as the rebels had been firing indiscriminately at civilians, he said. In November, the M23 rebels briefly captured Goma, which borders Rwanda, withdrawing in exchange for a series of demands, including negotiations with the government. DR Congo's Information Minister Lambert Mende told the BBC's Great Lakes Service that some of the shells that fell on Goma on Thursday had come from the direction of Rwanda. The five civilians who had died in the shelling included children and one woman, he said. Rwanda has repeatedly denied UN allegations that it has been backing the M23 rebels. Like Rwanda's leadership, M23 fighters mostly come from the Tutsi community. They deserted from the Congolese army in April 2012, forcing an estimated 800,000 people from their homes in the ensuing unrest in the mineral-rich region. Peace talks taking place in Uganda this year to resolve their grievances have stalled.